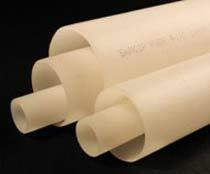 The PVDF Pipes, offered by us, are known for their exceptional chemical resistance and high tensile strength. These PVDF Pipes are also resistant to creep and fatigue. Owing to their stability under sun and ultraviolet radiation, our PVDF Pipes are used as base resins for exterior coatings. We are a well-known PVDF Pipes Exporter, Importer and Supplier in India.